Despite not fitting into the sink as well as it could, our collapsible dish rack works fairly well, but when it is packed full of dishes and cooking tools, it makes the whole sink area feel cluttered. 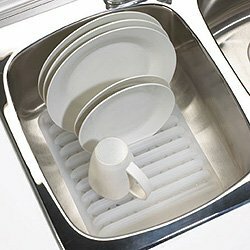 In addition, with all of the dishes in the rack, cleaning the entire sink area is difficult and accessing the water sprayer and faucet is hard. For all of these reasons, we've had our eye out for a new dish rack. This is exactly the type of thing Eric and I were looking for, so I hastily ordered one. After placing my order, I thought to myself, "I probably should have measured our sink to make sure the rack will fit." And so I did...and wouldn't you know it, the dimensions of drying rack were too big. But it was too late, my order was placed. I figured we could do a bit of altering after-the-fact and make it work anyway. As soon as the rack arrived, Eric attempted to trim it down to size with a pair of scissors. He did the best he could given his tool of choice, but the rack is still a tad too wide to fit in our sink properly. While this solution is most certainly a bastardization of the original design, we'll eventually get it to look right and function correctly. Until then, the tilt method it is!